Don’t miss a single broken page on the webpage. Get links from and to the broken page to easily remove it. 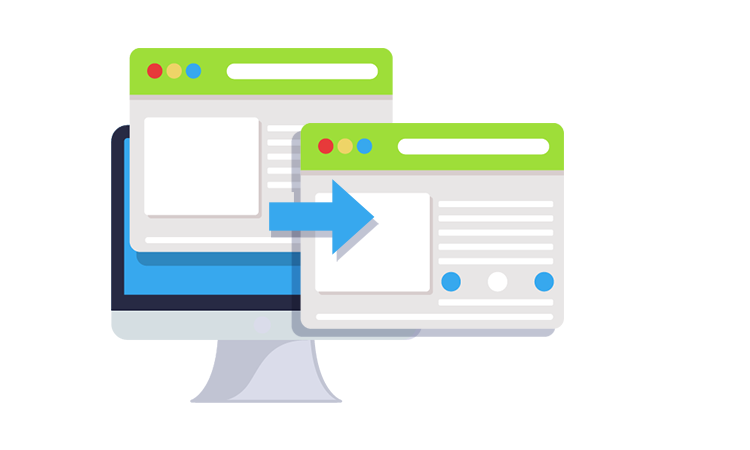 On-Page API can provide you with a list of duplicate pages. Get comprehensive data on duplicate pages of any website. Uncover each in- and outbound link of any webpage. Get a full list of page’s links with a full set of useful data. Easily filter out pages and data using our customizable filters. With OnPage API you can focus on pages with specific issues. On-Page API utilizes more than 70 on-page ranking factors. 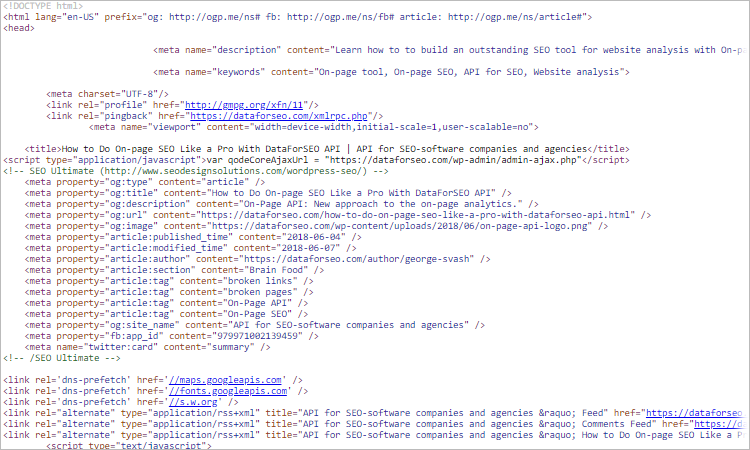 Analyze web pages against the huge variety of on-page parameters. OnPage API can provide you with a full list of on-site links. It helps to improve the internal linking patterns of the website and remove broken pages. 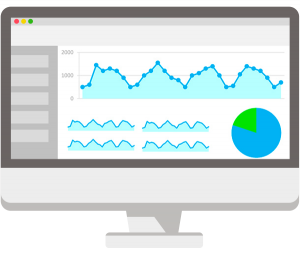 On-Page API has everything you need to build a robust tool for website analysis, which you can use yourself or sell to your clients. 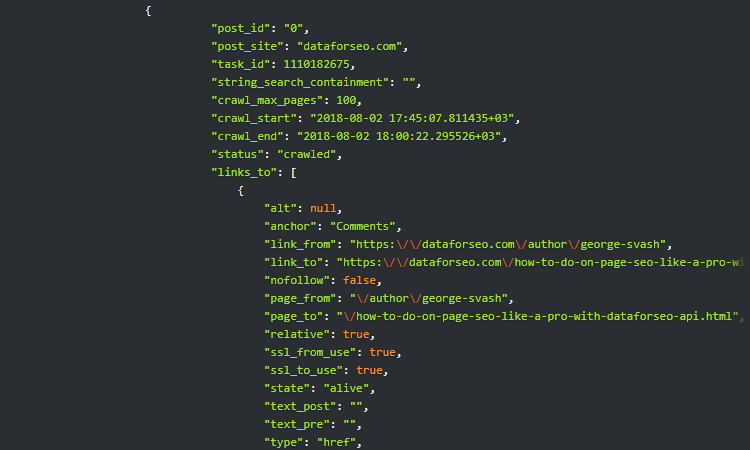 With dozens of available on-page parameters, extensive documentation, and affordable pricing DataForSEO is the best API solution you’ll ever come across. HOW MUCH DOES ONPAGE API COST? Our APIs are very easy to use. 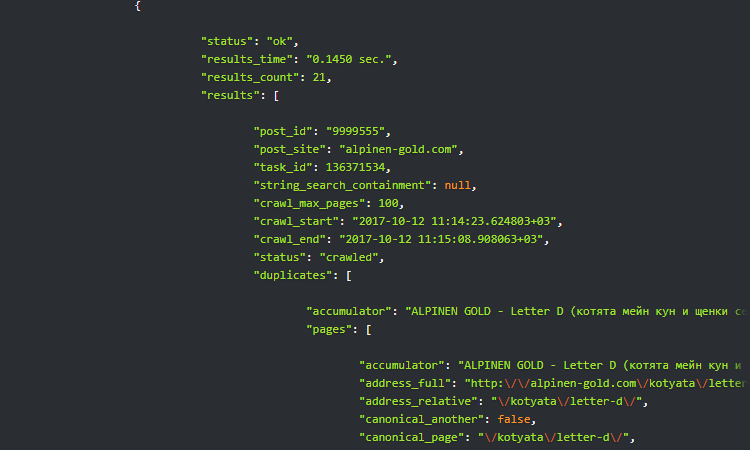 Just pull us a domain, add parameters, and get results. Simple, as 1-2-3. With our API you will always know how much you’ll pay. Every page scanned with On-Page API costs 0.25 credits. No tricks. You will get access to your personal cabinet where you can oversee and manage the usage of APIs in real time.